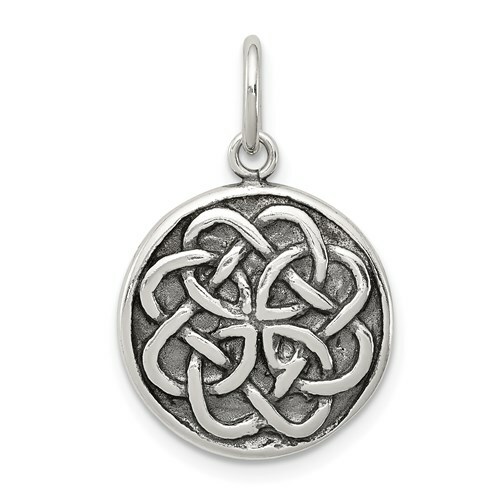 Sterling Silver Antiqued Celtic Knot Charm. Weight:1.32 grams. Item measures 11/16 inch tall by 5/8 inch wide without bail. I bought this for my teenage (15 years old) grandson. He's all about sports (plays several) but likes to wear some jewelry, so I wanted to find something that was definitely not feminine - this design was perfect. It is supposed to look old (hammered antique), and it does - my grandson knew what a Celtic knot represented, and he loves it - wears it all the time! And the price was very reasonable. I would recommend it.